Any Reasonably Competent Do-It-Yourselfer Can Change an Outboard Motor Water Pump in About Two Hours Time. Sometimes outboard motor water pumps give up the ghost in the middle of the season, when service technicians are swamped. You could miss two or three weeks worth of boating waiting for repairs. Or you could change the outboard water pump yourself. Begin disassembly by removing the bolts that fasten the lower unit to the midsection. Disconnect the shift linkage. Slide the two housings apart. If they won't pull apart, look for any bolts you may have missed. Saltwater motor housings and bolts may have corroded together and stubbornly refuse disassembly. Never use force. Just get a bigger hammer. In this case your hammer is an oxy-acetylene torch. Unfortunately the common propane torch doesn't put out enough heat. Warm the bolts or the parting line, depending on what's stuck. Then let it cool for an hour. Heat it again. Let it cool. Heat expands aluminum. Cooling contracts. Growing and shrinking breaks the corrosion allowing removal. If you must hammer the cases apart, use a rawhide mallet, not a ball pein hammer. Otherwise the cases may crack. If you can't split the cases, take them to a dealership and have the pros with an acetylene torch do the dirty work. Once the cases separate, look for any bronze locating pins that align them. Some motors have them. Some don't. Save the gasket if there is one. It prevents corrosion from gluing the case together. 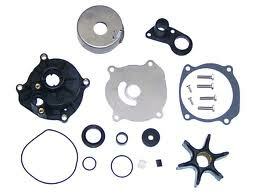 Remove the four or five bolt that secure the water pump housing to its base. Lift off the housing, the impeller and the thin, stainless steel base plate. You will likely find a bad impeller, one with stiff and/or missing blades. Examine the base plate and inside water pump housing looking for scoring caused by sucking sand up through the system. Either way replacing all the components now is cheaper than re-doing the job six months later. Finally, re-assembling fasteners with anti-seize ecompound may not be the best solution to the corrosion problem. This for the simple reason anti-seize paste and even grease contain microscopic bits of metal (aluminum and copper). Exposing dissimilar metals with an electrolyte, the water your drive is submerged in, induces galvanic corrosion. Marine grade grease is a smart alternative. Johnson/Evinrude dealers stock Triple Guard. Mercury has its own version Triple Guard is saltwater rated, and famous for the way it stubbornly sticks to an object without washing off. It lubricates without separating or hardening over time. Water pump housing bolts and gearcase bolts smeared liberally with Triple Guard are easily removed easily after years in saltwater. Regardless of brand, the best product to prevent bolts from seizing in an underwater application is a waterproof grease. Not automtoie anti-seize, unless it is a non-metallic formulation. 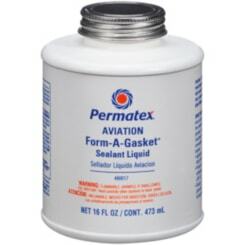 That said, some old-timer, factory-trained, OMC mechanics used to rely on Permatex Aviation Form-A-Gasket Sealant Liquid, the brown, gooey liquid in can with a brush in its lid. The sealer drys just enough to protect the threads, yet gooey enough to unscrew the bolt when it's time to be removed. Some drive shafts have an O-ring on the crankshaft end that slides up into the base of the crankshaft hub. Shine a flashlight inside the motor, making sure the old one isn't lodged inside the recess if the crankshaft internal spines. Liberally grease the drive shaft splines. Carefully align the water pump tubes and slide together. Be patient. And once again you may need a flashlight to see what goes where. Reattach the shift linkage. If you drop it inside, use a grease magnet to get it back out. Coat the threads of the bolts with marine grade anti-seize compound to make subsequent disassemblies easier. Do not make the mistake of over tightening the bolts or you risk stripping the threads. Final due diligence, check the gear case oil, looking for any sign of water intrusion. If the seals are bad, now is the time to replace them.